NOVEC is an innovative solution that reduces the risk of fire damage in critical applications and sensitive equipment. 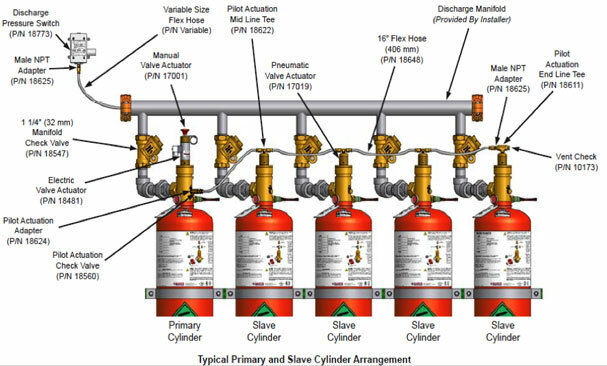 At a proper system design concentration, the extinguishing agent NOVEC Fire Protection Fluid absorbs sufficient heat to upset the balance of the fire. This cooling effect is supported by the oxygen reduction in the flame due to the volumetric expansion of the molecules. The high efficiency of the NOVEC system allows using a low extinguishing concentration. As a result, the user needs to store only a relatively small amount of the extinguishing agent to safely protect rooms. Additionally, the minimum 10 bar at the nozzle concept used by Siemens ensures fast and full evaporation of the NOVEC fluid, minimizing extinguishing times. Compact system designs are possible as NOVEC works with the NOVEC fluid, offering the lowest design concentration of all currently authorized extinguishing agents. Fewer cylinders and less space are needed for installation and storage because the liquid agent NOVEC fluid is stored in cylinders pressurized with 42-bar nitrogen. • Allows higher design flexibility and enables the realization of larger and more complex piping networks compared to low-pressure systems. • Special software comes installed that precisely calculates the ideal layout of the piping network, so the clients get an optimal solution tailored to their individual needs. • Can easily be adapted to existing ones with few alterations.